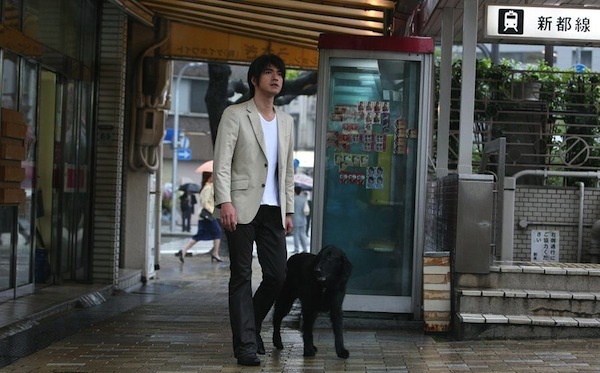 Chiba (Takeshi Kaneshiro) appears seven days before a person dies an unexpected death. His job is to observe the person for seven days, and then decide either to ‘execute’ or ‘pass over’. Getting his work quickly out of the way, he goes to the listening booth of a CD shop and indulges in his favorite pastime, listening to ‘humanity’s greatest invention’: music. He is...a Grim Reaper. Today, again, in the rain, he waits. His subject, her death due in seven days, is Kazue Fujiki (Manami Konishi), 27. She works for a manufacturing company, in the complaints department. Exhausted after her day, she emerges from her office. It’s time for the Reaper to go to work. Based on novel ‘The Accuracy of Death’ (Bungei Shunju Publishers) by Kotaro Isaka. Kotaro Isaka long resisted offers to have the book filmed, he is said to have given his ready consent if Takeshi Kaneshiro were to be the star. thewind Aug 25 2013 9:10 pm i like this film,, i like Takeshi Kaneshiro's style in the third act. barahachi Feb 08 2012 8:18 pm I saw this movie last night and I said, "Naru hodo.. a, sou iu koto desu ka. subarashii da!!!" This is a good movie and I like the somewhat innocent character of the grim reaper. kahji Jan 18 2010 9:33 am this is like city of angels. but he's not an angel. Ki Oct 18 2008 11:08 pm Being familiar with the plot synopsis in "Sweet Rain," I expected another big budget "Death Note" type of film. Takeshi Kaneshiro does play the Grim Reaper, an angel of death that visits a person 7 days prior to their impending death and determines whether their time's really up. After watching the film I was pleasantly surprised to find that "Sweet Rain" is a far lower key type of movie, with more substance than initially expected. The story consists of three separate segments that are more interrelated than you are first led on to believe. First segment provides the most engaging piece. Manami Konishi plays a social outcast with bad luck always surrounding her. When she meets Chiba (Takeshi Kaneshiro), a nice does of playful romance occurs between the two. You are also treated to several light hearted moments with Kaneshiro's Grim Reaper character attempting to blend in with regular humans. The second segment is the weakest of the bunch, having a generic yakuza story that we've all seen before. Veteran actor Ken Mitsuishi plays Toshiyuki Fujita, a gangster out to revenge the murder of his crime boss. He is helped by Shinji Akutsu, an underling that's not the brightest of Japanese teens. Meanwhile, Chiba comes into picture and observes the two as they head towards revenge. The third segment, starts off like a quintessential Japanese drama. Junko Fuji plays Kazue, an older hairdresser who works out of her house. Moments flow by slowly, with soft classical music playing in the background and the location in a small rural Japanese town. Things become more interesting when Kazue suddenly asks Chiba (who came in for a haircut), "You're the Grim Reaper right?" While "Sweet Rain" won't rank in any category as "great," the movie consistently engages in most categories (minus the weak middle segment). There's also attractive performances to be found from all the main actors: Takeshi Kaneshiro, Manami Konishi, and Junko Fuji. 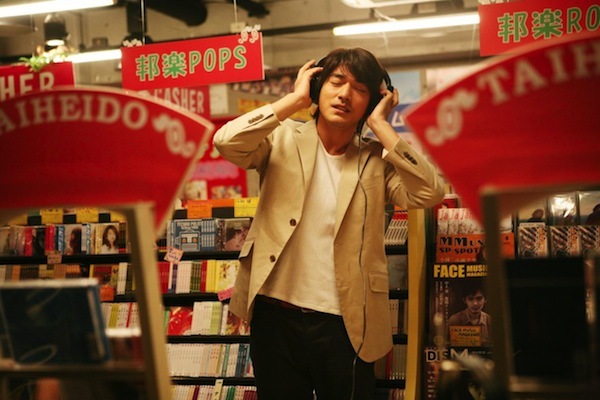 Although I haven't watched all of Takeshi Kaneshiro's films, his performance in "Sweet Rain" did strike me as his most agreeable performance since the, by now, legendary film "Chunking Express". Furthermore, the script, based on a popular Japanese novel by Kotaro Isaka, was particularly strong. 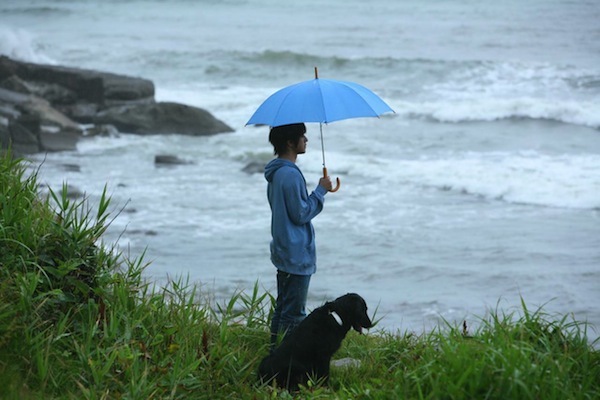 When it's all said and done "Sweet Rain" comes across as a more commercial Hirokazu Koreeda like film. Not to shabby I say. P.S. Takeshi Kaneshiro sure did look like he raided Ken'ichi Matsuyama's wardrobe in the third act. Being familiar with the plot synopsis in "Sweet Rain," I expected another big budget "Death Note" type of film. Takeshi Kaneshiro does play the Grim Reaper, an angel of death that visits a person 7 days prior to their impending death and determines whether their time's really up. 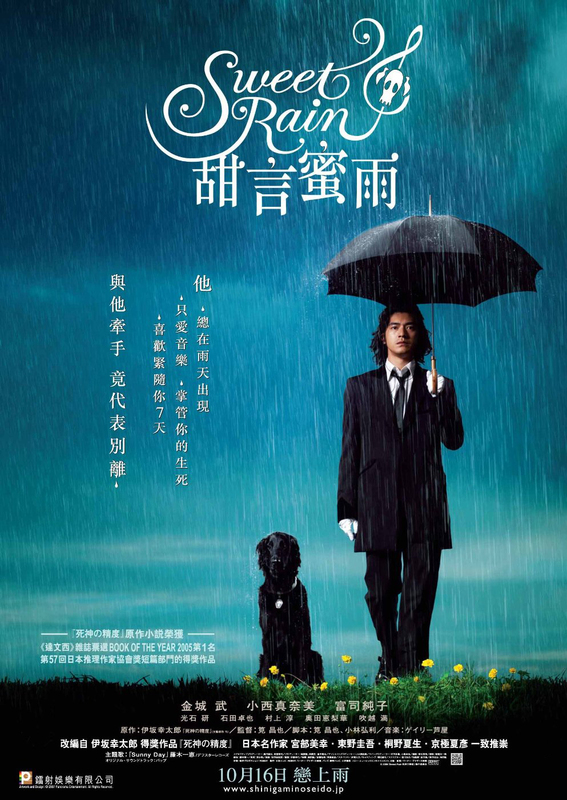 After watching the film I was pleasantly surprised to find that "Sweet Rain" is a far lower key type of movie, with more substance than initially expected. P.S. 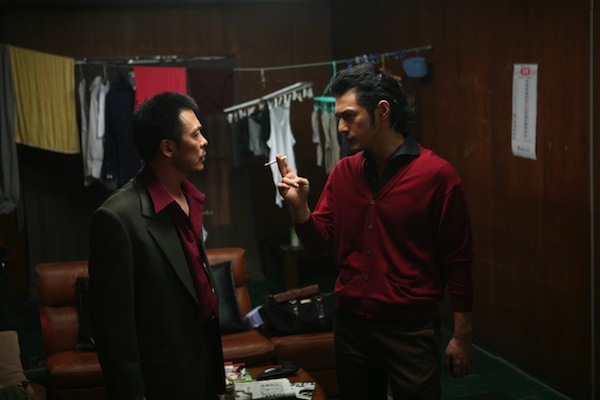 Takeshi Kaneshiro sure did look like he raided Ken'ichi Matsuyama's wardrobe in the third act.